Bits & Scraps Of My Life: DSC #9 Sketch Challenge this week! DSC #9 Sketch Challenge this week! Have you ever had one of those days where you feel like you are supposed to do SOMETHING, but you just aren't sure what it is?? That's me this morning!!! I feel like there iw someplace I am supposed to be, or something I am supposed to do....other than my normal Tina type stuff.......very weird. I think the 80's may have finally caught up with me......lol. I think maybe it's time to start using the scheduling and calendar feature on my phone!!! Well, here we are, the 2nd day of November!! Boy this year has flown by!! Did everyone have a great Halloween? We kept it a little low key this year. We usually go to the church celebration but didn't really feel much like fighting the crowd this year so we just did the trick or treating thing. We traveled a bit to a couple of neighborhoods near the schools since there aren't many kids in our neighborhood. I think trick or treating may becoming a dying art form :( Several place we went told us we were the only treaters they had all night. Kinda sad. But it was good for the kids cuz they got huge handfuls of candy everywhere they went.....lol. Only Jesse and Brandon trick or treated this year, and I think this may be Brandon's last year going. He just doesn't get into it much anymore. I recruited Steven to help out with walking them around while Jacob hung out here. I have a few pics but I don't wanna share too much because they will all be showing up in layouts over the coming days :) We went the el cheapo costume route.this year and Jesse wore a jacket he has that the hood zips over the face.....very scary tho!!! I tried very hard to get them both to go as zombies.......I LOVE the Walking Dead!!! But no such luck! And then I had the Jackyl Lumberjack song going thru my head all night.....it's rough being me sometimes.....lol. So there is my quick Halloween recap! Are we ready to move on to this weeks Digitally Sweet challenge??? We have a sketchy for you this week!!! I love sketches!! This one is one of Denise's digi sketches, I think its a fun sketch and she did an excellent job!! And it's her very first attempt! WOOOT! And here is my take using a couple of Halloween photos, I promise before next Friday y'all will be so sick of m and my Halloween pages.....lol. A page just isn't a "Tina" page without a banner on it :) The font I chose is kinda hard to read unless the layout is full sized, It's called Jokerman. 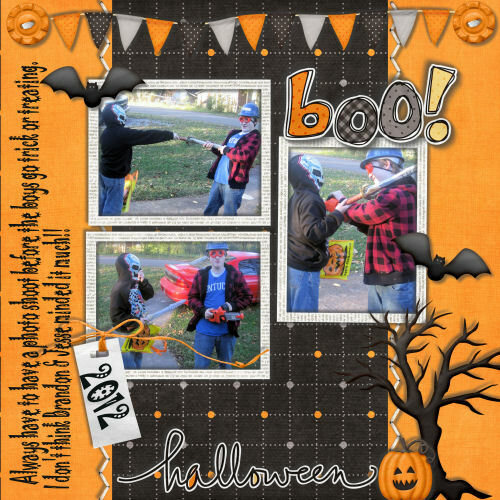 My journaling along the side reads "Always have to have a photo shoot before the boys go trick or treating. I don't think Brandon or Jesse minded much!" I created my page in PSP X and used BOO! 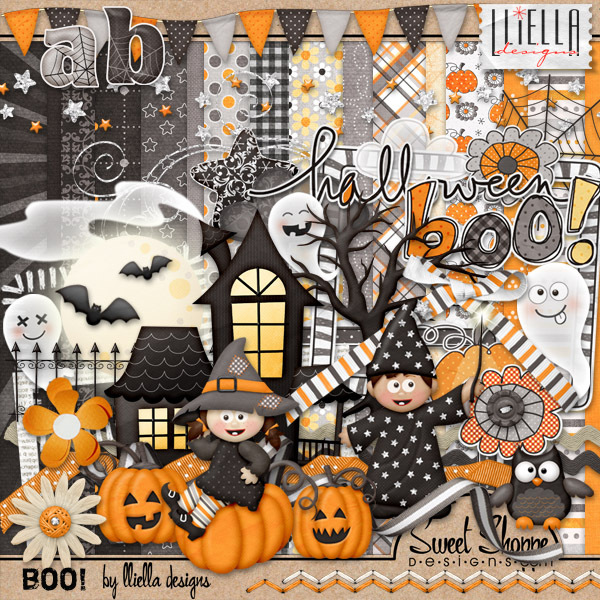 By Lliella Designs for Sweet Shoppe. Lots of really fun spooky elements and some real cuties for hybrid card making too! So .....wanna play along? 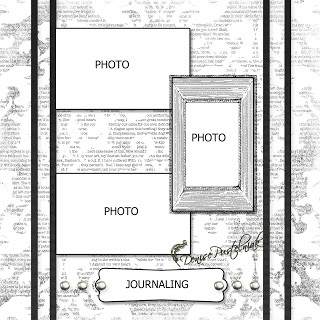 Simply create a digital layout based on this sketch and link it up by 11/8/2012 at Digitally Sweet!! HA!! The Village People!! LOVE IT!! LOVING your lo!!!! Awesome photos and loving the banner!!!! Totally fabulous work Tina and I love that kit you have used too. cute digi page... i wish i was able to create them - do you print them all out or just leave them on the computer?? I love your bright fun page, great photos and I love that kit. My girls got soaked doing their Trick/Treat - I think it rained all day! They still oved it and got loads of sweets. Love the colors on your fantabulous page! A+ for sure!